If you visit Arts & Crafts fairs and see the wide range of country craft items in some booths and wondered how to accomplish the finishing effects, this book does just that. There are 144 pages presenting 42 projects, many with one or more finishing alternatives. The different finishing techniques are described in the first couple of pages. Then each project is shown in full color with a description in a menu format. That is there is a list of items and tools needed to complete the project, followed by a step by step description of the finishing. The finishing can be done in two hours or less. The book does not deal with the wood parts directly, but suggests purchasing the unfinished wood parts, but does provide patterns that can be photocopied and enlarged or reduced to get the size desired for the particular project. 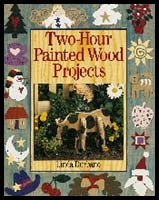 I strongly recommend this book to those involved with Country Arts & Crafts.